Hard Brexiteer campaign Leave Means Leave has been criticised for its very narrow leadership and supporting cast of predominantly old white men. Nigel Farage’s return to British frontline politics came in the form of a touring battle bus for the Leave Means Leave campaign. But the group, which pushes for a hard Brexit and harsher migration controls, has come under serious criticism for its very un-diverse chain of command. 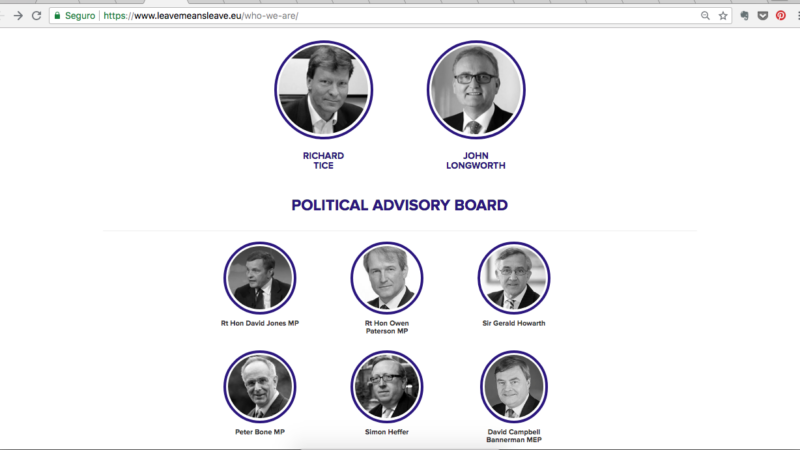 Both co-chairmen and the entire political advisory board of Leave Means Leave is composed of white men over the age of 50. They are also mostly very very rich indeed. For an organisation that purports to seize power back for the people, the Leave Means Leave campaign is a pitifully parochial little sausagefest. At the very top, Leave Means Leave has former Leave.EU chair and millionaire entrepreneur Richard Tice as one part of a chairing duo. His Brexiteering partner-in-crime is no other than right-wing businessman John Longworth. They were also, unsurprisingly, the founders of the campaign. The group of six political advisors does not branch out much either. It counts with three Conservative MPs, including the former minister of state for exiting the European Union, David Jones, as well as Owen Paterson and Peter Bone. Former Tory MP Gerald Howarth is also bart of the group, as is UKIP’s deputy leader and MEP David Campbell Bannerman. The sixth advisor is the British journalist and historian Simon Heffer. But the list of Leave Means Leave supporters does not fare much better. Of the 34 people listed, only two are women, and only one (who also happens to be one of the women – MP Suella Braverman) happens to be non-white. The youngest supporter listed is the Conservative MP for Middlesbrough South, Simon Clarke, who is 33 years old. The line-up was also target of plenty of jokes, mostly on the capacity of an all-male leadership to run anything successfully. A controversial member of the supporters’ list is the Tory MP for Boston and Skegness, Matt Warman, who originally campaigned for Remain during the 2016 referendum. His constituency, however, had the highest Leave vote from all of Britain, with nearly 75% of people supporting Brexit. Other well-known Brexiteer faces are also on the list, including Jacob Rees-Mogg MP and John Whittingdale. One infamous Brexiteer white male was not keen on being seen with the Leave Means Leave lot, however. Former foreign secretary, Boris Johnson, was said to have declined joining the group’s tour.